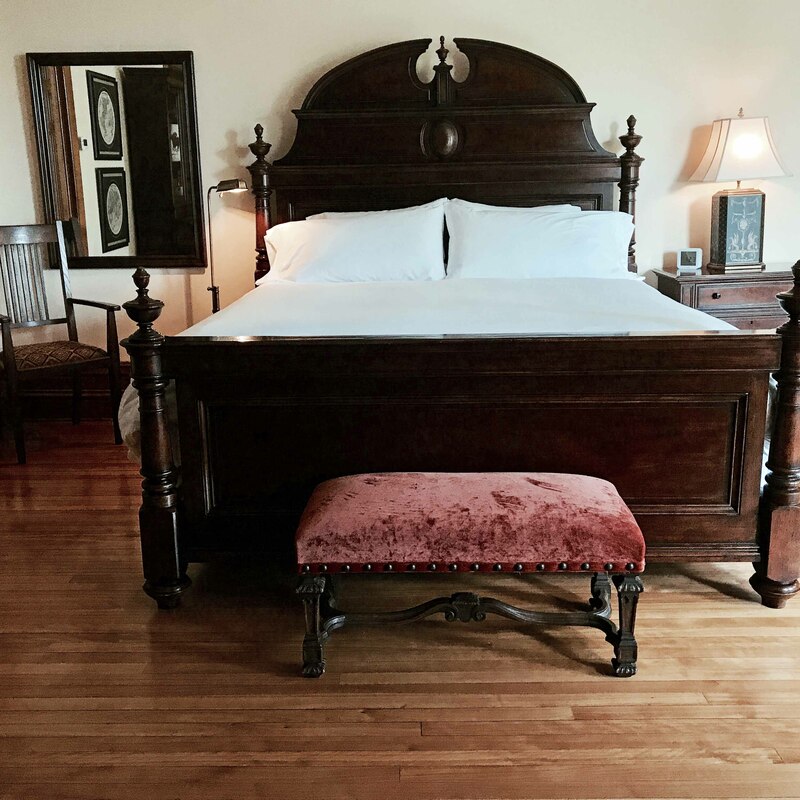 Reserve Castle La Crosse Luxurious Bedroom Suites - Stay with Us! 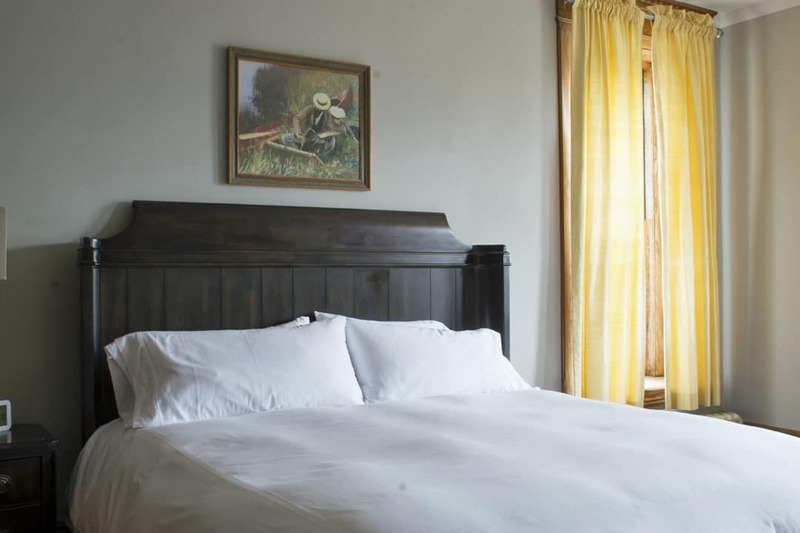 Castle La Crosse Bed and Breakfast features five cozy guest suites, each with private baths. The rooms are named for the exquisite woods used throughout the home. Enjoy The Oak Suite, The Walnut Suite, The Maple Suite, The Birch Suite, or The Mahogany Suite. Descriptions of each of our suites are listed below. A fresh, hot, delicious breakfast each morning. Fresh linens and towels delivered daily. Free Wi-Fi offered throughout the Castle. Coffee and tea available in the Drawing Room from 7:00 a.m. until 7:00 p.m.
Room service is available upon request for a nominal fee; tailored packages can be created for that special occasion. We are located in a quiet neighborhood just blocks from the University of Wisconsin at 1419 Cass Street. Free parking is available on the property. To book a room, call the inn Toll Free at 1-844 726-5808 or via email at stay@castlelacrossebnb.com. Gift Certificates are also available; please call us for more information. Relax in the Oak Suite; it's a customer favorite! The Oak Suite is on the second floor of Castle La Crosse. Located at the back of the house, this room sports soaring windows with spacious views of tall trees and the carriage house. Oak Suite guests enjoy a cozy room containing a luxurious four-poster bed with plush bedding. Contemporary artwork, comfortable seating, and a writing desk complete the room. The spacious bath is simply stunning. Luxurious and Spacious, the Walnut Suite is built to Impress. The Walnut Suite is on the second floor of the Castle. This suite is directly opposite the Grand Staircase located through the master's alcove. Originally built as a master bedroom, this suite has an impressive set of extra large bay windows that overlook the grounds and towering pines. The Walnut Suite also showcases one of nine original fireplaces and has a rather spacious layout, containing a stunning king-size bed, antique brass chandelier, armoire, seating, and a writing desk. The modern bathroom contains a walk-in shower with tile flooring and a marble vanity. This room is built to impress. So comfy you'll want to stay in bed all day! The Maple Suite is perfect for a romantic getaway, so drop us a line to reserve this room ASAP. You'll be glad you did. Added Bonus: A Welcome Basket will await you upon your arrival. The Maple Suite is also on the second floor of Castle La Crosse, directly opposite the Grand Staircase and at the front of the house. Initially built for the owner's children, this suite has an impressive set of windows containing the original stained-glass. A spire is located in the corner of the suite and contains built-in seating. The Maple Suite features one of nine original fireplaces and is a guest favorite because of its inviting soft yellow color, a modern upholstered king size bed, an 18th century French armoire, chocolate velvet love seat, and a writing desk. The bathroom features a walk-in shower, tile flooring, and a marble vanity. This Suite also features an additional room attached to the bathroom and can be rented as extra space for an additional charge of $75. No bedroom space is included, but it does sport a turret, workarea seating, and living space. Soothing cool bedding and soft yellow light: Birch Suite. The Birch Suite is located at the front of the house, off the Grand Staircase, and on the second floor of the Castle. Initially built for the owner's children, this suite has an impressive set of windows containing the original stained-glass, providing great afternoon light. Painted a soothing gray and featuring heavy golden yellow draperies, this suite provides ultimate privacy for our guests. The Birch Suite features one of nine original fireplaces and includes a large king-size bed, comfortable seating, and a writing desk. Ample hanging space is provided. The bathroom features a walk-in shower, all-white tiling, and a porcelain vanity. The Birch Suite is perfect for a peaceful, relaxing stay and offers guests a chance to recharge from a hectic lifestyle. Overlooking the entrance to Castle La Crosse, the Birch Suite provides the only opportunity to view the tower from inside the house. The Mahogany Suite is not yet available for our guests, but we will keep you posted on its opening. This suite, once outfitted as a media room, will be elegantly decorated in an old Hollywood theme. The suite is large, with theater lighting, and is the only room with a private screened porch overlooking the back gardens. With lovely windows and an art-deco chandelier, your stay in this suite will take you back to the days of Silent Film and Vaudeville. Enjoy the Sitting Room of the Library. Browse our Books! 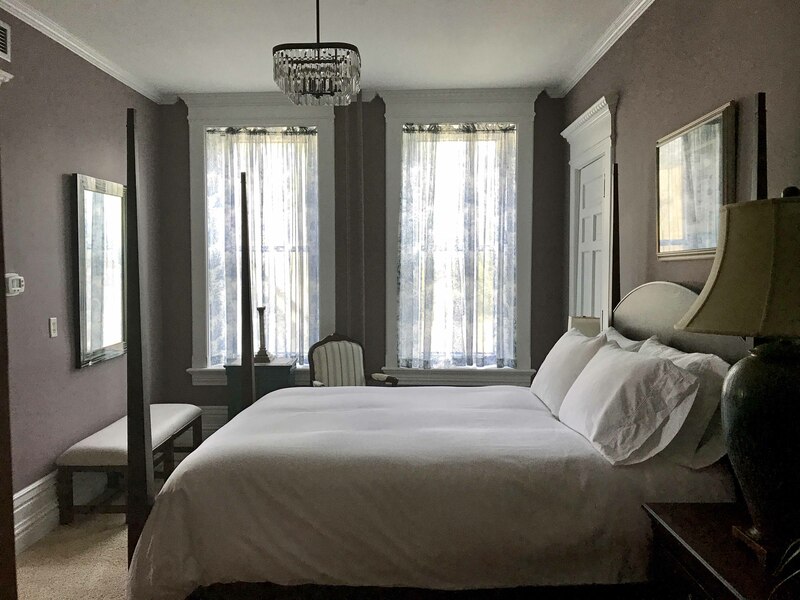 Castle La Crosse features five ground floor rooms, perfect places for our guests to relax, mingle, or just unwind after a visit to one of the many venues in town. If you need seating arrangements for a private gathering or business meeting, notify our staff. Free WiFi is offered throughout the ground floor. Check-in is at 3 p.m. Once you are settled in your room, join us on the Ground Floor to mingle with the guests, meet the innkeepers, and chat before you begin your evening in town. We have a tray of freshly baked chocolate chip cookies waiting for you at Check-in. Please feel free to take one. They were made just for you! Remember, Coffee, tea, and water are always available throughout the day, from 7:00 a.m. until 7:00 p.m.
Our library has a fabulous selection of books, so pick one out and enjoy the story snuggled in a chair near the fireplace. Don't forget your cup of coffee or glass of wine! Our Grand Piano is also available for events in the Music Room. The innkeepers will be happy to assist. Please note that, for the sake of our home and our guests, Castle La Crosse is a smoke-free property. Call the Castle at 1-844-726-5808 for more information. You may also click the button below to purchase your certificate. 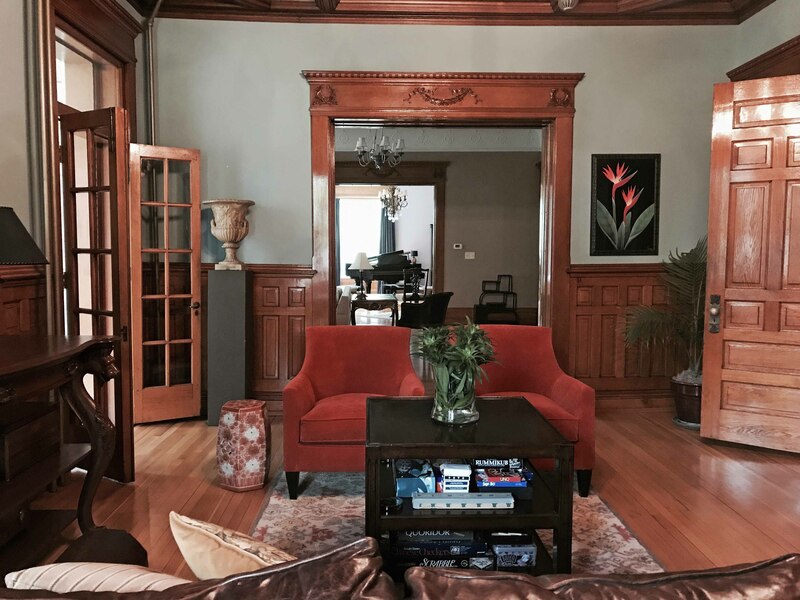 Note: Castle La Crosse Bed and Breakfast is privately owned and owner-occupied. The owners reserve the right to refuse service or accommodations to anyone for any lawful reason. Any behavior on the part of guests that affects the safety or peaceful enjoyment of other guests may result in eviction without refund.